Music and dancing will no doubt raise a smile, but it will take more to make people shop at Sainsbury's, writes Karmarama's chief strategy officer. We’re all trying to create emotional engagement at the moment, to connect with people on a deeper level, to be more meaningful. It’s tough. Not all clients want it or believe in it and it can lead to a war of attrition, with bold creative ideas suffering. So hats off to Sainsbury’s and a campaign that scores so well on "likeability". It’s a big, fat dollop of feel-good fun and a brave new approach by both client and agency. With a thumping, catchy music track, a distinctive look and a mildly voyeuristic approach to what people get up to in their kitchen, it ticks many of the "emotional engagement" boxes. Plus, it’s got dancing! And Britain loves dancing. It’s also modern, young-at-heart and bang-on-trend. It’s likeable, but not particularly meaningful. Or clear what problem it’s solving. It feels disconnected from the reality of what Sainsbury’s really is. "Living well" is full of rich purpose and there’s an important story to tell about food, staff, responsibilities etc. But distilling it all down to people dancing in their kitchen as the end benefit of living well feels a bit calculated, designed to play to our emotions rather than connect back to what’s really important about the brand or business. It’s all too bread and circuses, like the "distracting boss" sketches in TV series Big Train: when the staff ask for their bonuses, the boss distracts them with cute puppies while he leaves the room. So box ticked on a lovely, likeable campaign, but a question mark on how connected it is to the reality of what Sainsbury’s truly is. To help people shop, not just smile, they need more than music and dancing. Maybe the next instalment will have something more genuine about the brand. I hope so. I’d hate to see such brave ambition fail. 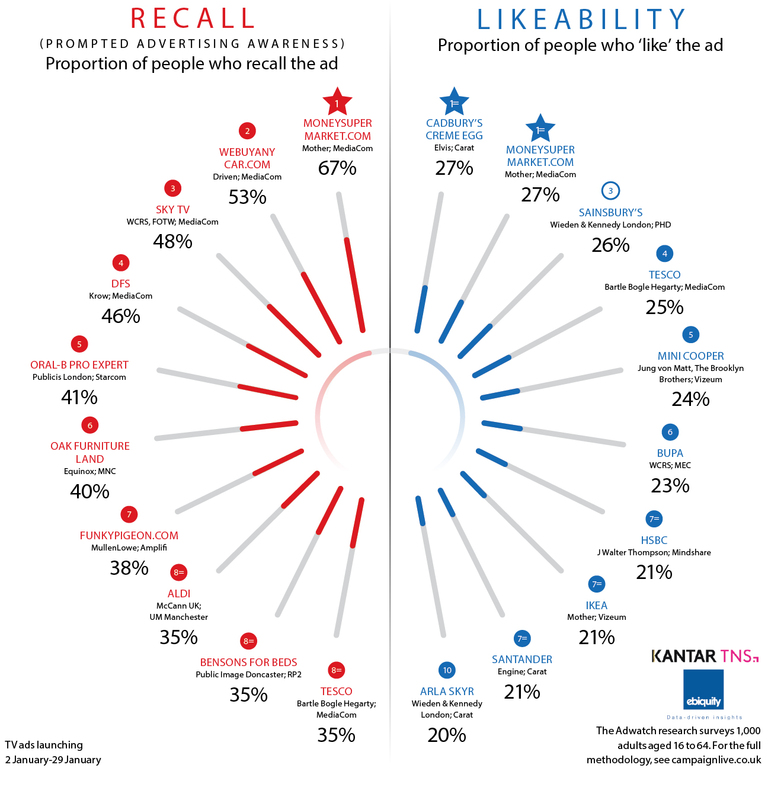 Adwatch prompted advertising-awareness research was conducted by Kantar TNS as part of its twice-weekly OnLineBus omnibus among 1000 adults aged 16-64. For details of the survey, contact emma.dolby@tnsglobal.com (020 7656 5890). Ads were compiled by Ubiquity (020 7650 9700) and Mediaedge:via UK (020 7803 2000). Sid McGrath Is the chief strategy officer at Karmarama.